This kind of speakers can be used by battery or by electric power. They are created for an easier use. 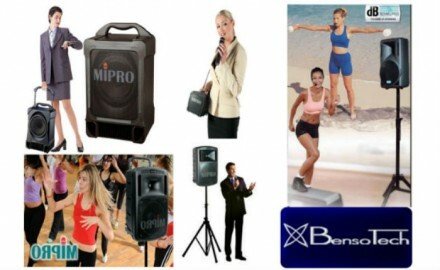 No cables required, easy to use with music and voice, they can be supported by a floor stand or can be placed on a desk. Recommended in schools, meetings, products presentations, exibitions and fairs, holiday parks, pools activities and anywhere it's important to work with sounds and voice without electrical power.